Caspurr the Courageous, here - Commander-in-Chief of the Impurrial Guard, King of the Tigger-Tabbies. 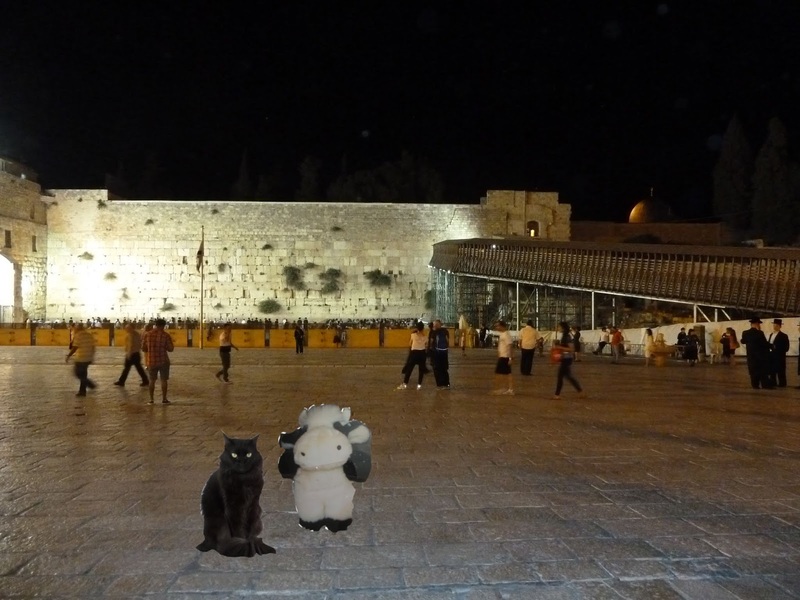 As We purr-omised, this Post is going to be about the Visit of Flat Moo to the Old City of Jerusalem! There is a lot to see in the Old City, so We spent the whole day there with Moo. And by equally good fortune, Sara was able to make time, despite her extremely busy schedule (this being the height of the Tourist Season), to show Us around the archaeological excavations and explain effurrything to Moo, who had neffur seen an archaeological excavation before and who was fascinated to hear how layer by layer, the earth is stripped back to discover the historical remains underneath, going further and further back in time. 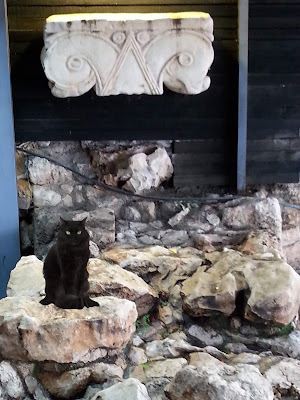 One of the most exciting discoveries in the City of David excavations is a Large Stone Structure which the archaeologist Dr. Eilat Mazar believes was the Palace of King David. Not effurryone agrees with her - but We like to think she is right. Psssst. Don't tell a soul (because Mummy doesn't like people to be able to guess her advanced age), but as a student, Mummy took part in one of the last digging sessions of the Southern Wall, as well as one of the first seasons of the Ophel/City of David excavations. Now it was time to enter the Old City Walls. The City Wall in existence today was built in the 16th century CE by the Sultan Suleiman the Magnificent. It had seven gates - but an extra gate, the New Gate (no prizes for guessing why it is so called) was added in the 19th century CE - and one gate, the Golden Gate (known in Hebrew as Sha'ar Harachamim - שער הרחמים - The Gate of Mercy) has been sealed for hundreds of years and, according to Jewish tradition, will miraculously open when the Messiah comes. We entered the Old City by the Zion Gate, where, in 1948, there was a failed attempt by Israeli forces to break through into the besieged Jewish Quarter of the Old City, during the War of Independence. It is called Zion Gate because it faces Mount Zion, where King David is supposed to have been buried. Here you can see Moo just outside the Zion Gate. If you look carefully, you can still see the bullet holes from the War of Independence! Jerusalem is a furry special city because it is holy to THREE great religions. We took Moo to see the Holy Places of all three, of course. Muslims believe their prophet, Muhammed, flew here by night on his magic horse, El Burak and landed where Al Aqsa now stands. They also believe you can see the footprint of his horse in the huge rock which is in the centre of the Dome of the Rock. But 1700 years before that, King Solomon built his Temple on this hill and that is why We call it the Temple Mount. And according to Jewish tradition, the Rock is the Foundation Stone of the World. Some believe that is where the Holy of Holies was in Solomon's Temple. Others say it was the site of the altar. It is also believed this was the site where Abraham prepared to offer up his son, Isaac, as a sacrifice. We also took Moo to see the Church of the Holy Sepulchre. This is the site of the Crucifixion, Burial and Resurrection of Jesus, according to Christian belief. We have no idea who those people are who walked into the picture! There is a lot to see in the Church of the Holy Sepulchre, including lots of little chapels belonging to different denominations, some of which can only be reached by narrow, winding stairs - which made things rather hard for Moo, and exhausting as well. By now, it was getting quite late. We had left the best till last. We wanted to show Moo the Western Wall at night, when it is all lit up by projectors. The Western Wall is the last remnant of the Temple. It was actually part of the retaining wall of the Temple Mount which is the holiest place in the world to the Jewish People. Since this is the month of Ellul, the last month before Rosh Hashana, the Jewish New Year, when it is customary to recite special purrayers of repentance, known as selichot, there were rather a lot of people there, despite the lateness of the hour. 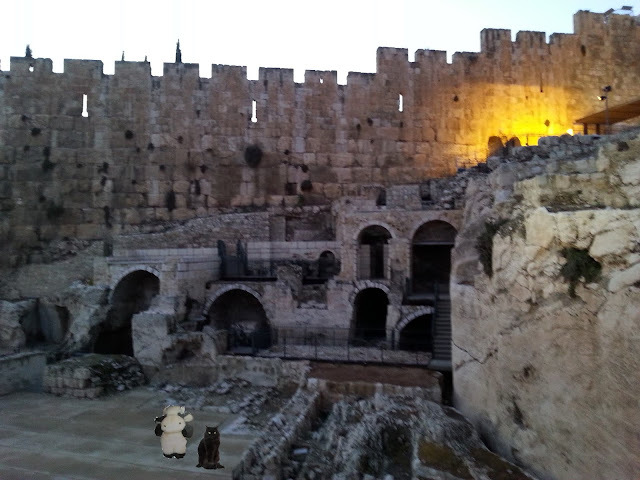 Here you can see Moo and Trixie, with the Western Wall in the background and behind that, the golden-topped Dome of the Rock. Moo was furry impurressed and decided she also wanted to go and purray at the wall and leave a note there. This was rather awkward, considering that she - like Us - lacks opposable thumbs and can't write. 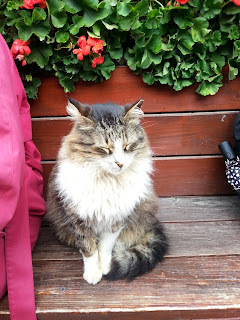 It is true that Our Human had accompanied Us, as Official Photographer, but Moo said that what she wanted to write was a Secret, and she wouldn't share it with ANYONE. In the end, she decided to go and whisper her secret purrayer into one of the cracks in the Wall. So We don't know what it was that Moo purrayed for. But We are sure her purrayer was heard. After that, We all decided to go and purray too. And then We walked back through the darkened streets to the Jaffa Gate and Mummy caught a taxi and brought Us all safely home. What an adventure for Moo! To be able to see that kind of history. Wow, Moo sure got the VIP tour with you! We enjoyed these pictures very much, as they brought back wonderful memories of my visits to your amazing city! Moo is welcome to stay for the High Holy Days and if she does so, We would like to invite her to stay for Succot also. Then she could see Our beautiful Succah.